Tri-Union Seafoods is recalling 2,745 cases (equal to 107,280 cans) of Chicken of the Sea brand 5-oz. 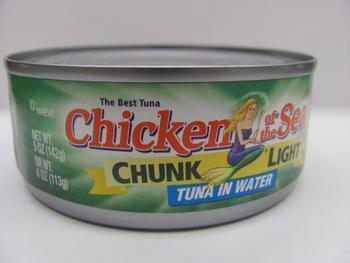 canned chunk light tuna in oil and 5-oz. canned chunk light tuna in water. The product may have been undercooked due to an equipment malfunction. There have been no reported illnesses to date connected with the affected products. The UPC code (also known as the bar code) is found on the label of the product. The Best By date and the product lot codes can be found on the bottom of the can. Customers may return the product to the store where purchased for a full refund. Consumers with questions or concerns may call the 24-hour recall information line at 1-866-600-2681.